You know those people who always have their holiday shopping done months ahead of time? Yeah…I’m not one of those people. I’m more of a “run to the mall on Dec 23” kind of girl. I would like to share some gift-giving ideas with you. These amazing products would make wonderful presents at any time of the year! This Montreal-based fashion designer offers a wide selection of stylish necklaces, rings, bracelets, wallets, handbags, earrings, watches and fragrances. Her line has something special for the fashionista in your life. Caroline Néron offers high quality but affordable products for women, men and even a new collection for tweens. This is a cool Canadian brand that has my support! Oribe is a full beauty line that offers make-up, skincare and fragrance products, as well as a line of hair-care products. It was developed by celebrity hairstylist Oribe Canales and provides a wide range of options that will delight any make-up lover. Both the lipsticks and the nail polish would make great stocking stuffers. Ecco is a Danish company that creates footwear for men, women and children. Their shoes and boots are made in their own tannery and production facilities, ensuring that their products are of the highest quality. Their waterproof and water resistant boots ensure that your feet stay dry whether you’re wandering around the city or hiking up a snowy mountain. They have a great line of golf shoes for all the golfers in your family, and if you’re just looking for something you can wear every day, they have the stylish metallic sneakers. This local company cuts down on its costs by forgoing a retail space and cutting out the middleman so that they can offer you the most affordable prices. Their bouquets come wrapped in denim with a hidden hydrating pack instead of in a bulky box, which is not only adorable but makes them a lot easier to transport. The best part is that if you live within their delivery radius, which covers most of the downtown core of the GTA, they offer free two-hour delivery. Anita has been providing lingerie and swimwear for women of all sizes since the 1880s. Anita is passionate about creating items that celebrate a woman’s body. In addition to everyday undergarments that are available in sizes AA-H, they also have specialty options for nursing and maternity, post-mastectomy, and full-figured women. One thing I love about them is that their larger sizes are just as stylish as their smaller ones, only with more supportive straps. As someone who’s been resigned to boring beige bras most of my life (or worrying about spaghetti straps that could snap at any minute), I definitely appreciate their consideration. Anita also has a full range of swimwear, including some really cute maternity options, like their adorable belly band for moms-to-be who want to show off their baby bumps in bikinis. 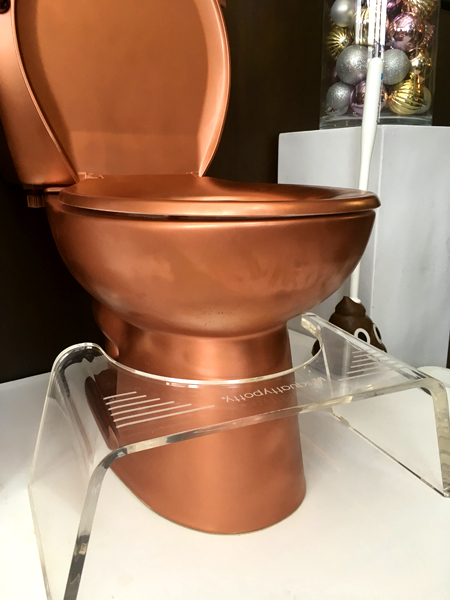 If you’re looking for something a little bit different and quirky, then Squatty Potty might be something to consider. It looks like a little footstool that wraps around the base of your toilet and allows you to be in a more natural position while you, you know, do your business. The Squatty Potty comes in three different colours – white, black and transparent – so it will blend seamlessly with your décor. Any of the items from Y-Volution would make a perfect gift for any member of an active family. If you have a new mom in your life, you can check out the 3-in-1 Strolly, a compact stroller that gives you the option of front facing mode to keep an eye on the baby, forward facing mode so the little one can see out, or tricycle mode when your child is ready for a little more independence. Kids that are a little older will be thrilled to zip down the street on their light-up Neon scooters. Or if your kid wants to try roller skating but you don’t want to have to keep investing in new skates as they grow, you can get them some Neon street rollers – clip-on wheel attachments that you can use to turn your regular sneakers into skates. I’m sure that any of these Y-Volution products will help make me Aunt of the year with my niece and nephew. Here’s a question: how do you get a mattress under a Christmas tree? It’s easy – you buy one from Endy and it comes delivered in a box no larger than a hockey bag. The memory foam mattresses from this all-Canadian company are available in six different sizes. The largest size - a California King - is still a great deal at only $950. I got a chance to lie down on one of their test beds and it was so comfy I definitely could have stayed there all day. Endy also offers pillows stuffed with memory foam, which allows you to customize them to your desired firmness, and they come with a pouch that can be used as a travel pillow. Endy also has a new line of bedding will be available this fall.